Little Blue Ribbon chose the other road. stayed on the road that led into the woods where their grandmother lived. and with dark cherries, sun-warm still and shaped like the hearts of tiny birds. formed a fist and she knocked on the huge door, made entirely from black oak. were a princess with a glamorous retinue. Little Blue Ribbon went into the castle. was touched by the wind and loosened with whirling fingers from her hair. Alexandra Seidel is not entirely sure how to deal with fairy tale creatures but she suspects that trusting them might get you into trouble or eaten, whichever comes first. Her work about trust and other issues has been published or is forthcoming in Foundling Review, Niteblade, The Horror Zine, Danse Macabre, ‘decomP’, Apparatus Magazine, Word Riot, Star*Line and others. 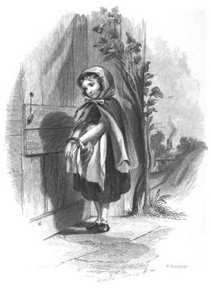 IMAGE: Illustration of “Little Red Riding Hood” from Poems by Frances Sargent Osgood. Carey & Hart, Philadelphia, 1850.